Visions of Jesus Christ.com - Sacred Heart, Immaculate Conception Statues and many other items are graced with blue, red and gold Escarchas. Gold Coast Australia part 2. Sacred Heart, Immaculate Conception Statues and many other items are graced with blue, red and gold Escarchas. Gold Coast Australia part 2. See part 1 [here]. 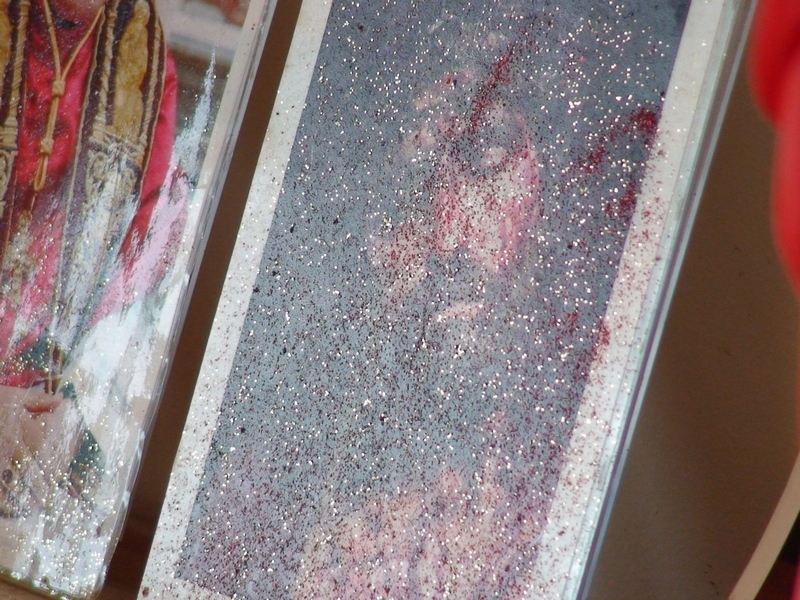 Passion of the Christ - Red and gold Escarchas on the laminated picture. Saturday, August 2, 2008 from [True Life in God] prayer group Gold Coast, Australia. On the table of our altar there are two statues: the statue of our Lady of the Immaculate Conception, and the Sacred Heart of Jesus. Both statues have glitter and oil on them. There is also glitter on the table of the altar itself, and on all the objects that are on the table. The colour of the glitter on the statue of our Lady is predominantly blue, and that on the statue of our Lord red and golden. The large picture of the Face of Jesus on the wall has oil and gold glitter coming out of the Mouth. The small statue of the Child Jesus also has glitter, mostly blue.